Dog chews are the number one reason that receivers are damaged. The large dog breeds are not the only ones that can damage a receiver by chewing. To prevent dog chews from the very first day, we highly recommend using a chew protector on the receiver and especially if multiple dogs are going on the system. Dog Guard’s chew protectors feature easy snap on, slide off design with a sleek fit. 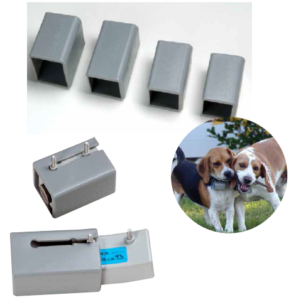 They are tough and protect the receiver from dog chews, rub-throughs and other damage. Chew protectors are a low cost prevention for your investment.